I have walked around the walled city of Intramuros many times, and the historical forts and buildings as well as the colorful ancestral houses have always been charming to me. Intramuros is an attraction I also recommend to foreigners who are visiting Manila for the first time. Recently, I was given the chance to see Intramuros another way – riding a bamboo bike on a guided tour. 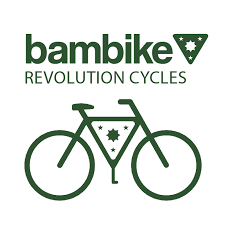 Bambike is a social enterprise that builds bamboo bikes with fair-trade labor (employees are paid fairly) and sustainable building (bamboo is a great eco-friendly material!). They also take guests on bamboo bike tours around Intramuros and Bonifacio Global City. First time to tour Intramuros on a bamboo bike! Bambike’s bamboo bikes are as strong as steel bikes (yes, they’ve tested it!) yet so lightweight and easy to bike. Each bike takes 50 man hours to build. Bambike has also won an award for its design at the Katha Awards at Manila FAME. I could feel the ease and lightness of the bamboo bike when I tried riding it. A Bambike bamboo bike up close. The frame is made entirely of bamboo. We went on the 2 hour and 30-minute tour of Intramuros (P1,200) which took us to nine attractions around the walled city. Our group was assigned a tour guide (which they call a Bambassador). Russell Leyco was already a seasoned Intramuros tour guide before he joined Bambike, and he support’s the organization’s advocacy. Our safety was secured as there was Russell riding out front, and a “sweeper” at the back (much like in mountain climbing) to ensure that no one is left behind. They also direct vehicles sometimes to ensure that we safely cross the busy roads. During the tour, I was happily surprised as I found us visiting spots in Intramuros I haven’t been to yet, like Puerta Real Gardens. It was also nice revisiting classic Intramuros spots like Fort Santiago (Jose Rizal’s prison) and Manila Cathedral. At Galleria de los Presidentes, our first stop. The place literally means “Gallery of Presidents,” and indeed there was metal art of past Philippine presidents here. Up at the fort is a view of a golf course. This is my first time to see the Intramuros golf course from this perspective. Outside Puerta del Parian. It was closed during our visit, though, so we couldn’t go inside. Russell sharing some trivia about Puerta del Parian. This is one of the earliest entrances to Intramuros. We parked our bikes to walk around Fort Santiago. There are also “huggable” trees like this! My first time to see this life-sized figure of Rizal in Fort Santiago. I haven’t been to this fort in a long time. We went outside the fort to see Pasig River, where we stayed to rest for a while. Heading back to the Plaza San Luis Complex, we made a quick stop to San Agustin Church. Lovers outside San Agustin Church! San Agustin Church is a famous wedding venue. We headed back to the Bambike headquarters, where they offered local craft beer. …and bought some snow cones to cool off! The Bambike ecotour was a fun tour that helped me see Intramuros with fresh eyes. It is definitely worth trying, both for Intramuros first-timers and old-timers! Try it for yourself. The rates are reasonable too! Tours start at P600, which is the 1-hour express Intramuros tour. Intramuros night edition – P1,200, 1 1/2 hour. Even better for summer. Filipino experience tour – P600, 1 1/2 hour. The tour is done in Filipino. If you want to ride the bike on your own, you can rent one for P100/hour.